David L. Wolper - Official Website Of Television & Film Producer. In 1999, TV Guide chose David L. Wolper as one of the 45 people who made a difference in television history, "a true original whose vision and innovation shaped the medium. As one of television’s top creative forces, his many contributions to broadcast history have imbedded themselves in the American psyche." Wolper and his company, in his over 50 years in show business, have made in excess of 300 films which have won more than 150 awards including Oscars, Emmys, Golden Globes, Peabody's and recognition through retrospectives at the world’s great film festivals. He has received the entertainment industry’s two most prestigious honors: the Academy of Motion Picture Arts and Sciences’ Oscar, the Jean Hersholt Humanitarian Award, and by the Academy of Television Arts and Sciences' induction into the Television Hall of Fame. 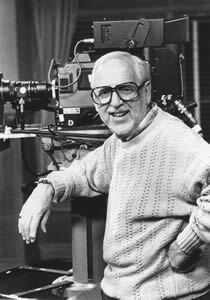 Born in 1928 in New York City, Wolper attended Drake University in Des Moines, Iowa and the University of Southern California where he studied Cinema and Journalism. At USC he was business manager of the humor magazine, "Wampus." The editor was Art Buchwald later a Pulitzer Prize winning columnist. As a publicist for the school play Wolper's most remembered stunt was dressing a student in a gorilla outfit and crashing the 1948 Academy Awards. The gorilla had a sign on it’s back, "U.S.C. Varsity show No Love Atoll" It worked, on March 20th 1948 the L. A. Times carried a story about it with a photo. Wolper left school early in 1949 to go into that new medium called television. In 1949 upon leaving USC, Wolper, with his high school buddy Jim Harris and others set up their own television distribution company, Flamingo Films. The few stations were hungry for product so Wolper crisscrossed the country selling old films to the only 50 television stations on the air The films included old movie serials like Flash Gordon and Buck Rogers, various terrible old shorts and the first feature film on television, The Adventures of Martin Eden. He personally attended the opening of over 30 T.V. stations the day they went on the air. In 1951, in a 30-million dollar deal Flamingo Films licensed the exclusive television rights to Superman. Jim Harris was President and Wolper treasurer and both just 23 years old. Later Wolper arranged for the Kellogg Company to sponsor the about to be produced 90 Superman episodes. His company became a major force in documentary films with 9 Oscar documentary nominations, 4 in a row and one win, 2 Peabody’s and just over 100 other awards. He broke the network hold against independent documentaries when his documentary based on Theodore H. White's Pulitzer Prize winning book, Making of the President 1960, was shown on ABC in 1963 and won the 4 Emmys, including the highest Emmy award, Television Program of the Year. Time Magazine labeled him Mr. Documentary. For some of his television documentaries he formed an association with six of America's most distinguished organizations to produce television specials; Smithsonian Institution, American Heritage Magazine, Time Magazine, Readers Digest, United States Golf Association, and the very popular National Geographic Society Specials. "I will never forget what you did to start my career" wrote Jacques Cousteau in a letter to Wolper after he introduced Cousteau to television in 1967 with the Jacques Cousteau Television Specials. In 1960 Wolper signed an exclusive television contract with America's 50 Astronauts for a series of specials on the space program. In the 1970's, he optioned the rights to Betty Freidan's ground-breaking book, The Feminine Mystique the roots of the Women's Movement in America. Not a single advertiser or network would broadcast the controversial book. He did TV documentaries on many other books including William L. Shirer's Rise and Fall of the Third Reich, and John F. Kennedy's A Nation of Immigrants. His CBS series of specials Appointment with Destiny was the origins of the T.V. docudrama. And he did the first Biography series on TV in 1962. Time Magazine chose Wolper’s documentary D-Day as one of Top Ten Television Programs of 1962. In 1972 he produced the documentary feature film Visions of Eight, the official film of the 1972 Munich Olympics. He was able to sign up eight internationally renowned directors and each did a segment. Participating were Milos Forman (Czechoslovakia), Claude Lelouch (France), Arthur Penn (United States), John Schlesinger (England), Kon Ichikawa (Japan), Mai Zetterling (Sweden), Michael Pfleghar (Germany), and Juri Ozerov (Soviet Union).In 1972 Wolper’s theatrical film Hellstrom Chronicle won the best Documentary Oscar. When he went into mini-series, Wolper transformed three best selling books into 3 of TV's highest rated miniseries Colleen McCullough's The Thorn Birds, John Jakes' North and South and one of the highest rated and most critically acclaimed television programs of all time, Alex Haley's ROOTS. Wolper's Carl Sandburg's Lincoln was televisions first mini-series broadcast in 1974. But it was the success of Roots that started the network miniseries craze. Next Wolper tried comedy TV series. The first time out his company in association with James Komack had two hit shows Chico and the Man and Welcome Back Kotter. When Wolper turned to dramatic movies for television, he concentrated primarily on dramas based on fact: with Stanley Kramer he made The Court Martial of Lt. William Calley and The Trial of Julius and Ethel Rosenberg. Other films included Collision Course (Truman firing McArthur), The Betty Ford Story, Fatal Deception (Life of Mrs. Lee Harvey Oswald), I Will Fight No More, Forever (the story of Chief Joseph) and Murder in Mississippi (the killing of the three youngsters during the civil rights movement) and many others. Adding to his arenas was theatrical motion pictures. He produced the cult classic Willy Wonka and the Chocolate Factory, and the 1997 Oscar nominee as best motion picture of the year, LA Confidential. Some other Wolper films include, If It’s Tuesday This Must Be Belgium, This is Elvis, Wattstax, Bridge at Remagan, Imagine John Lennon, Victory at Entebbe and Surviving Picasso. In the second half of the 20th Century Mr. Wolper participated in three major Americana outdoor spectacular. In the late 1960's he was appointed by President Gerald Ford as Chairman of the President’s Council of the American Revolutionary Bicentennial Administration responsible for overseeing and coordinating all the celebrations of the 200th Anniversary of the United States. In the late 70's Mr. Wolper was appointed by Los Angeles Mayor Tom Bradley to the seven-man committee that successfully brought the 1984 Olympic Games to Los Angeles. He served as Vice Chairman of the Los Angeles Olympic Organizing Committee, a member of its Executive Committee and Chairman of the Television and Ceremonies Committee. He was the Producer of the acclaimed Opening and Closing Ceremonies of the 1984 Los Angeles Olympic Games. For the 100th Anniversary of the Statue of Liberty, the weekend of July 4th 1986, Lee Iacocca, head of the committee asked Wolper to create and oversee a celebratory event. Wolper became Chairman, Executive Producer and creator of Liberty Weekend, the four-day celebration, in New York, to commemorate the 100th anniversary and the completion of the restoration of the Statue of Liberty. At the end of the twentieth century Wolper returned to documentaries when he produced 3, 10-hour documentary series summing up the 20th Century. Legends, Icons, and Superstars, explored biographies of the 50 most influential people of the 20th Century chosen by a committee of Time Magazine editors and was telecast on CBS Cable. Heroes of the Game, depicted biographies of the greatest golfers of all time, and was produced in association with the United States Golf Association for their 100th anniversary. Celebrate the Century, telecast on CNN summed up the great events of the 20th Century and was produced in collaboration with the United States Postal Service’s special issue of 20th Century stamps. Grand Marshall of the 99th Tournament of Roses Parade. Located in the Doheny Library at the University of Southern California is the David L Wolper Center. The Center contains Wolper’s 50 year collection of papers, photographs, contracts, scripts, budgets, tapes and other memorabilia available for students, researchers, publications and the public. The Center also presents major exhibitions which have included exhibitions on Frank Sinatra, Willy Wonka, John Wayne, The Presidents, The Barrymores, Marilyn Monroe, and the 1984 Olympics. Among Mr. Wolpers personal Awards are: 2 Oscars, 2 Peabody’s, 4 Emmys, 3 Golden Globes, and 2 NAACP Image awards. He has been inducted into 4 Halls of Fame; Television (1989), Boys and Girls Club (1993), Broadcast (2000), and Events (2002). He has received a Lifetime Achievement Award from 7 organizations; TV Guide (1985), Producers Guild of America (1990), International Documentary Association (1989), National Academy of Television Arts and Science -International Council (1998), Thailians (1995), Black Filmmakers (1990), and the NATPE Educational Foundation (1998). The International Documentary Association annually presents The David L Wolper Student Documentary Award. Mr. Wolper was on the Founding Boards of KCET Los Angeles, The Thalians, L.A. 84 Foundation (He is Chairman Emeritus), the International Documentary Association, the USC School of Cinema-Television Cinema Circulus ,the International Volleyball Association, (he also served as Commissioner), and the American Center For Wine, Food and the Arts. In addition, he served on the boards of the American Film Institute, The Los Angeles County Museum of Art, the Academy of Television Arts and Sciences Foundation,, the National Board of the Boys and Girls Club of America, the Los Angeles Olympic Organizing Committee, Mt. Sinai Hospital, the United States Golf Association Foundation, the D-Day 50th Anniversary Commission, the Martin Luther King Federal Holiday Corporation and the Museum of Television and Radio. A confirmed family man, a devotee of the arts, entertainment and sports, especially golf, Wolper and his artist wife, Gloria, live in Beverly Hills CA. Wolper has three children, Mark who is President of The Wolper Organization, Michael and Leslie who are business executives, and 10 grandchildren. ©2003 David L. Wolper Co.
We hope you enjoy your visit. We are currently developing our site. We will be adding more information daily.